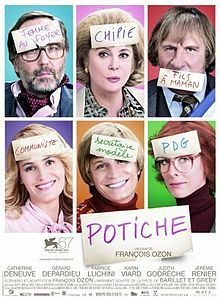 In French a "potiche" has several definitons: on one hand it is a decorative vase, but also figuratively it is someone in a honorary position without real power, someone such as a “trophy wife”. It comes across very much like a stage play with the actors going through the motions, almost in a silly tongue-in-cheek way as though it’s just a lark, despite its strong message for woman’s liberation. The acting for the most part is fine but it’s just that: it’s acting, a pretence, a caricature of the real thing. The final scene is 100% stage acting and serves only as a reminder that it’s not to be taken too seriously. for some sexual situations (but hardly deserving this harsh a rating compared to what is shown in most R-rated movies). A third definition for “postiche” is “false” and could well be the producer’s inside joke given that the film really does not ring true.